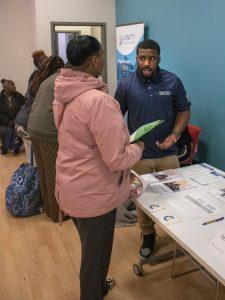 Dozens of women from Calvary Women’s Services and partner agencies attended our annual Fall Career Fair on November 8th. From morning until early afternoon, women had the opportunity to discuss their qualifications and job opportunities with a diverse group of employers and service providers. The goal of the fair was to bring together women from the community with employers who had open positions and were eager to expand their recruiting pool. 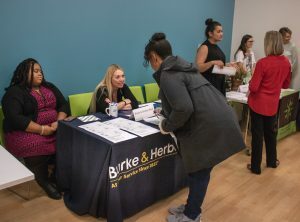 The eleven employers and service providers attending the fair included: Burke & Herbert Bank, Colonial Parking, DC Connect, Dress for Success, First Class Workforce Solutions, Four Seasons Hotel, Pendergrast Alston Consulting Services, RCM of Washington, Sweetgreen, Together We Bake, and Unity Health Care. Calvary’s biannual career fairs are a part of our job placement program, Step Up DC. 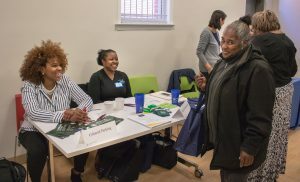 The purpose of Step Up DC is to provide comprehensive support to participants before, during, and after their job search to ensure women are employment ready and have the skills they need to retain and build a career. Additional photos from the event are available for viewing here.